The Healthcare Mat by Smart Step Flooring is an anti fatigue mat that dramatically reduces fatigue and discomfort associated with long term standing or stationary standing. The unique one-piece construction has a soft inner design structure that serves as a preventative approach against potential back pain, leg pain, or foot pain. The revolutionary, ergonomically smart design interacts with the body by suspending your body weight, thus reducing impact on the joints. Your weight will frequently shift and rebalance itself, reducing stress and strain of many daily activities. 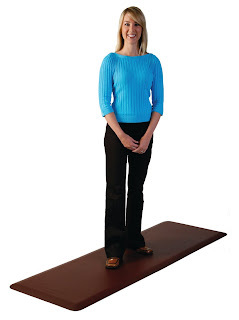 Smart Step Healthcare mats promote better posture, proper circulation, muscle conditioning, and a sense of well being. Smart Step Healthcare Mats have been successfully servicing the Department of Homeland Security, TSA, international airports, over 400 national retailers, major hotels, casinos, and is the #1 selling anti fatigue mat in the salon and spa industry.